EDIT: Christ. I just realized it's to separate the lower stage. It's an inverted decoupler. I've literally never tried to use it because I saw it functioned as a decoupler and thought "Wow, that's really stupid". Wait, what? You don't need an extra decoupler if using an engine plate? Why didn't anyone tell me?!? Weird I have this distinct memory of testing it when it first came out and it did exactly what you thought. I've never tried it since. Yeah it's meant to be an all-in-one interstage. I didn't use them for a few months after getting MH. Now that I know how to use them, they're so freaking handy that I can't believe I ever played without them. They really need to be stock. At least the 2.5 meter and 3.75 meter ones. Maybe even add a 1.25 meter version for clustering sparks? They really need to be stock. Actually, I rather suspect that they strongly need not to be stock. Squad does need to have a continuing source of revenue, if they're going to keep doing KSP development. I don't work for Squad and therefore am not privy to their internal sales numbers, but I can't imagine that brand-new sales of the stock game are still a big thing; KSP has always been a bit of a "niche" game (it's never gonna put Fortnite out of business), and I wouldn't be surprised if most of the people who would ever buy KSP have already done so. Therefore, they need to give people a reason to buy Making History and any other DLC that they develop. The engine plates are a major game-improving feature, so they're precisely what they should avoid putting in the stock game. If they take all the coolest parts of Making History and put them in the stock game for free, why would anyone buy Making History? Maybe even add a 1.25 meter version for clustering sparks? I very strongly agree. They totally need a 1.25m engine plate, though for business reasons I expect it belongs in Making History rather than the default game. Maybe if we clamor for it persistently enough, and in great enough numbers, they'll add it for us. In the meantime, if you just can't wait for it to be stock, I included a 1.25m engine plate in the MissingHistory mod. (It's just some clever rescaling of the 2.5m engine plate, I didn't create any model for it). And yes, it's awesomely convenient. Well, for me, the fact that they live on the "decouplers" tab of the vehicle editor was kind of a clue. I thought it just decoupled the engines and thought “why the hell would I want to do that?” I suppose if I didn’t need the TWR anymore it would be slightly useful? Makes way more sense that it decouples the stuff connected to the bottom node, not the top. Dont feel so bad, the Engineer’s Report has no idea what to do about the Engine Plate’s decouplers either. Not as if they ever have any idea what to do about anything ever. Not like they ever have any idea what to do about anything ever. It took me awhile to figure out what you guys were talking about. I stopped using that thing about 5 minutes after I got the game. I was just sick of it constantly whining about decouplers being on backwards when they, you know, weren't. No wonder I could never find the bloody things, they're in the decouplers section? Bah. The problem is that they not only don't behave like normal decouplers (which decouple above them), but they don't actually say anything about their decoupling nature in the description. I mean, Heat Shields are 'decouplers' too, and they pop off, so why would I expect this random part that also decouples to now decouple in a fashion unlike any other part has before? Furthermore, people know that you stick a decoupler below an engine - that's just how it works. They're changing like 6 years of how we learned to build rockets in KSP and didn't even tell us! ADDENDUM: Are you 'A Boojum Snark' from Natural-Selection? The report is nice for ONE thing - it tells you when you've got blocked exits. I just wish the attachment points worked better. Whenever I have multiple clustered engines on them, they displace unevenly when thrust is applied. It's mandatory to have the engines auto-strutted to grandparent in order to avoid massive induced torques - still drives me nuts when I forget to apply the autostrut during design. True, but in my case, it was "well, let me stop and think a moment. It's on the Decouplers tab, so it must be some kind of decoupler. But the description doesn't say much. Okay, put myself in the designer's shoes, if I were building this part myself, what would I want it to do? ...okay, yes, it does exactly that." Agreed that they could definitely have a better description, though. Not sure what this "Natural-Selection" thing is that you're talking about, but yes, a Boojum. Don't worry. It isn't true until he tells you three times. Well, I'm pretty sure that how they work was explained somewhere in the old DevNotes during the development of MH. My main beef with the engine plates is that the decoupler symbol stays in the staging stack after the stage below it has been staged away. Maybe a tweakable option to remove it, like docking ports? Hmm, those can only be tweaked into the staging stack in the VAB, no? So is it like a decoupler with a fairing on it? And it essentially decouples at the fairing? I always just figured they were the big heavy ugly thingies people who insist on putting lots of engines in a predefined arrangement on, put engines on in predefined arrangements. The decoupling portion of engine plates had always escaped me. When learning to play a game is your first instinct to look at the devnotes? They actually weigh less than an equivalently sized Decoupler or Stack Separator IIRC. They do have some problems; they confuse the hell out of the stock Delta-V calculations and the automatic staging really doesn't get them. I suspect these two issues are related. You can also use them as payload fairings in some applications. Maybe if we clamor for it persistently enough, and in great enough numbers, they'll add it for us. In the meantime, if you just can't﻿﻿﻿﻿ wait for it to be stock, I included a 1.25m engine plate in the MissingHistory mod. (It's just some clever rescaling of the 2.5m engine plate, I didn't create any model for it). Isn't that broken at the minute? Pretty sure the description says it's messed up (unless you've fixed it very recently). The folks who made the 'Acapella' for the Making History stock mission also failed to figure out the decoupler feature of the engine plates, and put a redundant decoupler below the fairing of the engine plate. They look like interstage fairings, but don't shield contents from heat or drag. They cost about 1/10 as much as the similarly sized decouplers. The equivalent combination of stock decoupler and fairing, has about 20× the cost and 20× the weight of the engine plate. They﻿﻿﻿ ﻿cost about 1/10 as much﻿ as the similarly sized decouplers﻿. The equivalent combination of﻿ stock decoupler and fairing,﻿ has about﻿ 20× the cost and 20× the weight of the engine plate. So you should use one instead of a decoupler whenever you can? Well, obviously not, or I wouldn't be recommending it. 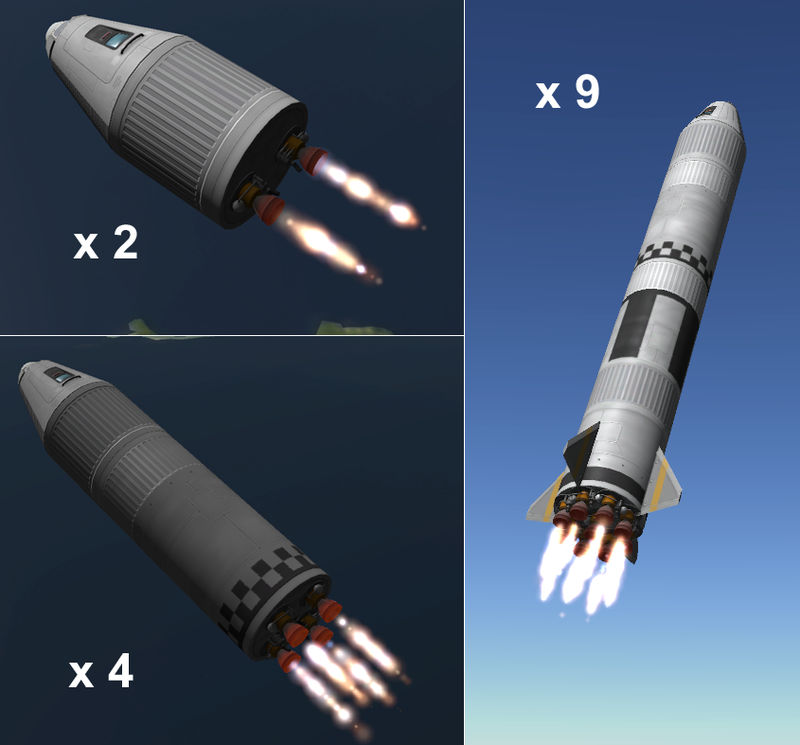 It was very briefly broken, way back several months ago when KSP 1.5 first came out (I assume that's what you're referring to), but that was just a momentary hiccup-- I fixed the problem within a couple of days and it's been fine since. So is it like a decoupler with a fairing on it? Well, I guess if you kinda squint at it sideways, it's a little like that, sure, but "fairing" isn't really what it's about. I always just figured they were the big heavy ugly thingies people who insist on putting lots of engines in a predefined arrangement on, put engines on in predefined arrangements. Well, they're certainly not big or heavy; they're compact and quite lightweight. As for "ugly", I wouldn't call them that at all-- frankly they don't have a lot of visual "character", they're basically just a compact unobtrusive thin white disk (not unlike the post-1.4 stack decouplers). They also have a visually bland "shroud", basically the same as an engine's shroud, which (like an engine) is present when something is attached below. people who insist on putting lots of engines in a predefined arrangement on, put engines on in predefined arrangements. They can do that, yes, but that's not what makes them cool-- if that's all they did, you could just manually cluster engines yourself with a mouse click or two, and what would be the point? The thing about them that makes them such an awesomely convenient game changer (for me, at least) is how they enable having smaller size engines in the middle of a stack without breaking up the lines or structural strength of the rocket. Suppose you've got a 2.5m rocket, but you want an upper stage to be powered by a Terrier, or a couple of Sparks, instead of some 2.5m engine? The engine plate provides a way to do that. I adore these things-- they provide a degree of design flexibility that really opens up a lot of options for me. They're one of my favorite parts in the game. It's a pity that the way they decouple isn't more obvious than it is, since the ability to decouple is the whole point of the part. Without that, there's not really anything useful there, and if a player misses understanding how the decoupling works, they'd probably wonder why the part even exists. Which would be a shame, since these parts are so incredibly useful and are such a design enabler. Oh believe me I wasn't mocking anything or anyone (not that I'm accusing you of thinking so! ); just ignorant with a dash of levity. I'm just old fashioned and haven't bothered with them much. I fall in and out of the habit of playing KSP and end up not knowing a lot of the small changes made to gameplay mechanics. For example I only recently learned that asparagus staging with fuel lines is irrelevant now due to being able to set fuel transfer priorities through radially attached decouplers. Sounds like I have to experiment with them to see what the fuss is all about!